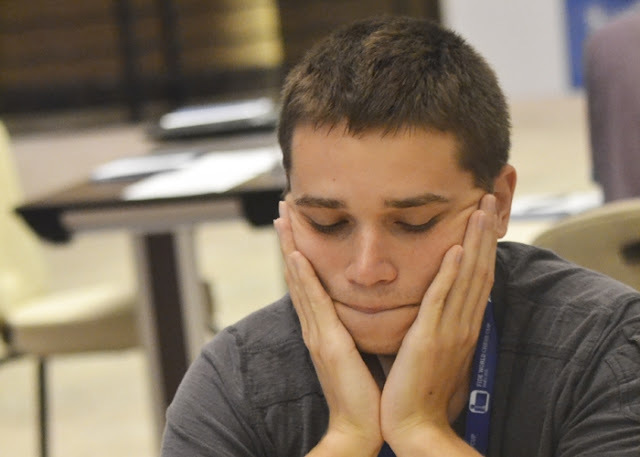 Anton Kovalyov, UTRGV junior majoring in computer science, has eliminated a grandmaster Sandro Mareco from Argentina in the second round of the 2015 World Chess Cup taking place in Baku, Azerbaijan. In the first game with black pieces Anton opted for a solid opening and firmly defended. The second game was way more complicated. Anton gave 3 pieces to win a queen. Before the opponent managed to coordinate the pieces, Anton started an attack and succeed with it. In the third round Anton is paired against a grandmaster Fabiano Caruana, who is currently rated 5th on the world’s rating list. Caruana was born in the US, then moved to Europe and represented Italy, but recently has come back to his original US federation. “Caruana is an extremely strong opponent with many interesting new opening ideas. His technique is phenomenal. However if Anton succeeds in obtaining dynamic complicated positions, his chances will visibly increase. Similarly to the first match against ex-world champion Rustam Kasimdzanov, due to differences in styles Anton’s chances of success will keep increasing with every tie-break and the reduction of time control. The 2015 World Chess Cup is an official part of the 2014-2016 World Chess Championship Cycle. There are 128 players, including 3 ex-world champions. Anton Kovalyov qualified to that prestigious event from the 2015 Continental Chess Championship, where he shared for the 3rd place. The winner and the runner up of the World Cup 2015 will qualify to the Candidates stage of the World Championship cycle 2014 - 2016. The Candidates Tournament to determine the challenger for the 2016 World Chess Championship Match shall be organized in the first quarter of 2016. Eight (8) players will participate in the Candidates Tournament and the winner qualifies for the World Chess Championship Match in the last quarter of 2016.